Team photograph. First row: Tim Merritt, john Bannister, Rob Castorina, Tom Green, Dave Zariczny, Troy Monks, Terry Hagenbuch. Second row: Brent Walton, Bill Baird, Mike Yanosik, Ron Ashcraft, Ernie Orsin, Joe Guardino, Andy Altman. 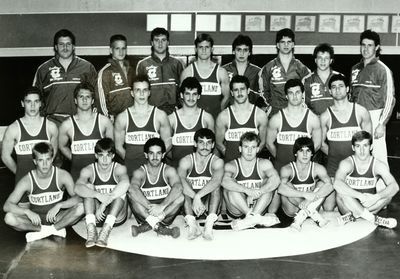 Third row: Mike Sanzo, Chris Williams, Tim Shifflett, Sean Yengo, Tony Barbatto, Bill Swiderski, Mike Bart, Coach Nighman.